Wednesday February 22nd 1899 It was a cold windy day and Will went to Hill Siding with John M-. and to town for the day on the train. I did ironing and mending. We went up to Stevens in the evening to a reception given for George & Flora It was a stormy evening. Thursday February 23d 1899 I was busy with the work a great part of the day I washed out my old serge dress that I am going to fix. I read in the evening. Friday February 24th 1899 Will went to town and Charlie took up a load of corn to grind. I dressed a turkey and did baking and sweeping. About three oclock I went up to Nelsons, calling at Gregorys on the way. Came back with Will on his way from town. I did extra work in the evening. 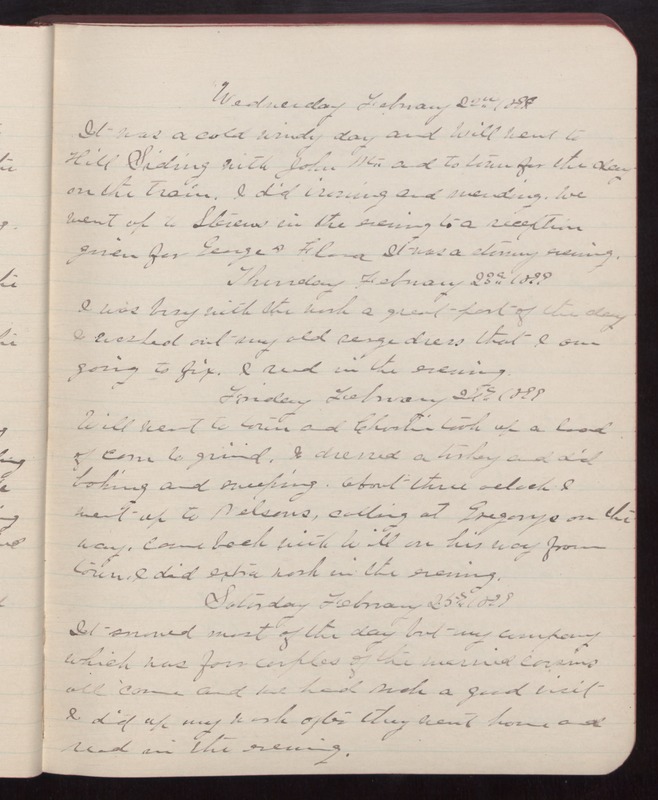 Saturday February 25th 1899 It snowed most of the day but my company which was four couples of the married cousins all came and we had such a good visit I did up my work after they went home and read in the evening.